The Expert Kit 4562ST contains three newly developed diamond instruments that incorporate depth markers (indicated by the letter "D" for "depth" in the reference number). 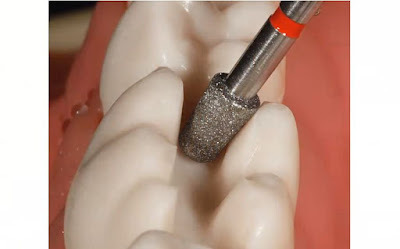 These marks indicate the required minimal occlusal thickness for successful all-ceramic restorations, including those fabricated with CAD/CAM techniques. The coarse-grit, rounded-edge, tapered 6847KRD.FG.016 diamond features depth markers at 2 and 4 mm. The shorter, rounded-edge, tapered 959KRD.FG.018 and the 845KRD.FG.025 diamonds provide depth marks at 2 and 4 mm and at 2 mm, respectively.